Funktion-One Branded FFA6004 Amplifier, brand new. 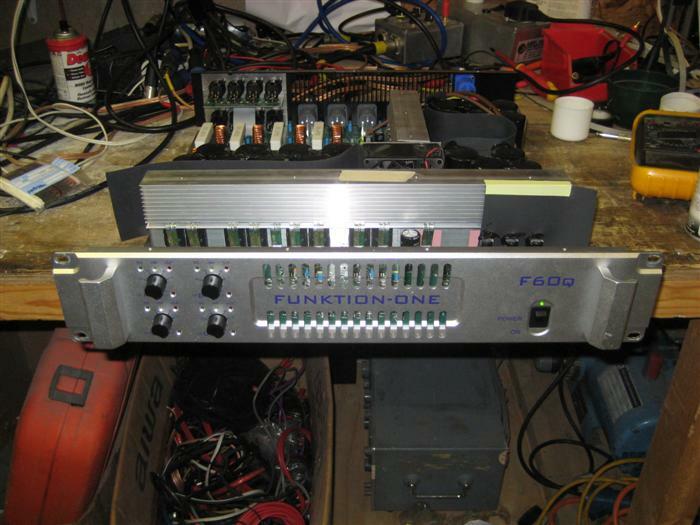 Good looking four channel half-bridge Class D amplifier from FFA / Funktion-One. Circuitry well laid out, excellent aluminium casework and front panel. However, potential EMC issues due to inadequate output filter design: Output filter components run hot to the touch even with no output, and dangerously hot (I got burnt) when amplifying high frequencies, posing potential reliability concerns. 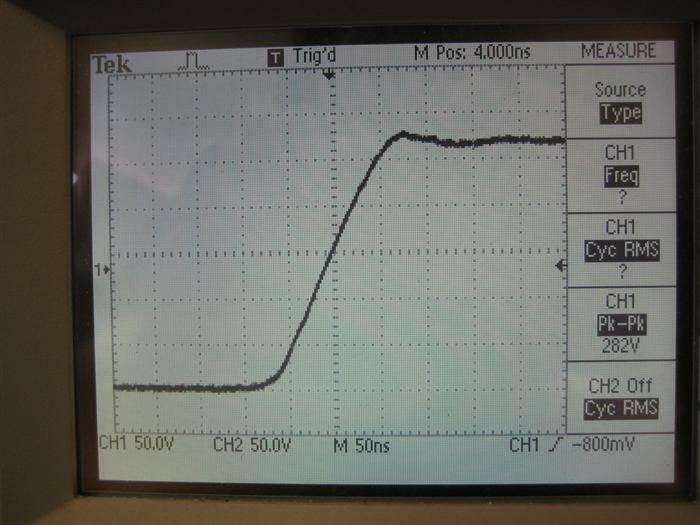 Very high harmonic distortion at high frequencies at high powers, worse at 8R loads. 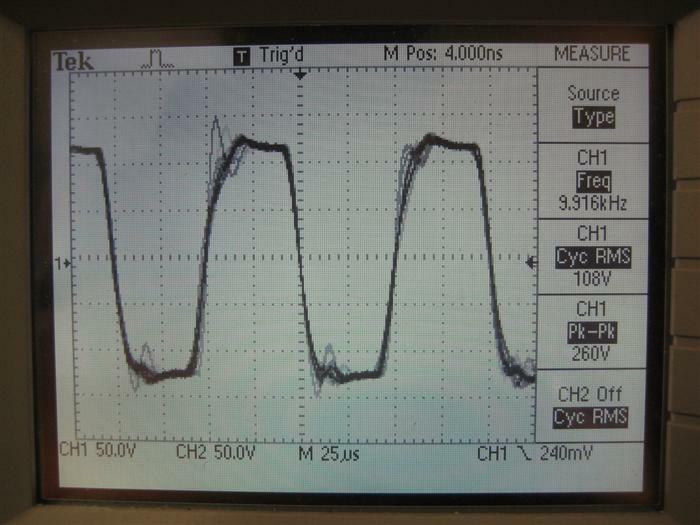 Oscillations and switching residual bleed-through are visibly present on the oscilloscope, as is lots of overshoot and ringing when driving 8R loads with a square wave. 4R square wave performance up to about 3kHz is good - the output filter seems to be load impedance sensitive and designed for 4R loading. 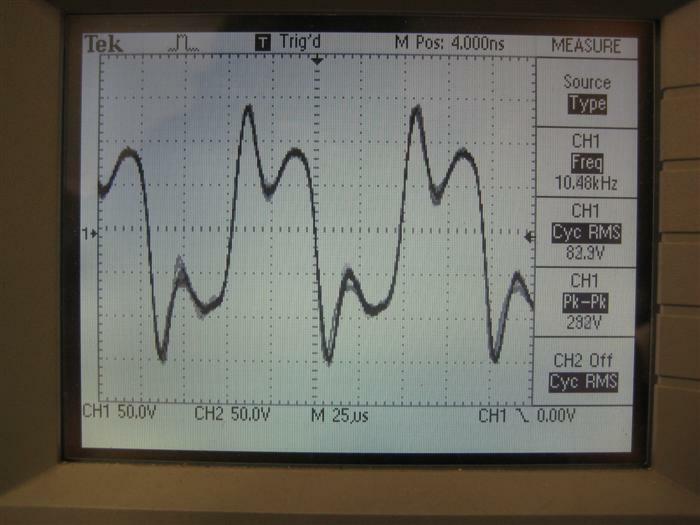 The PWM waveform prior to the output filter is clean and ringing free. 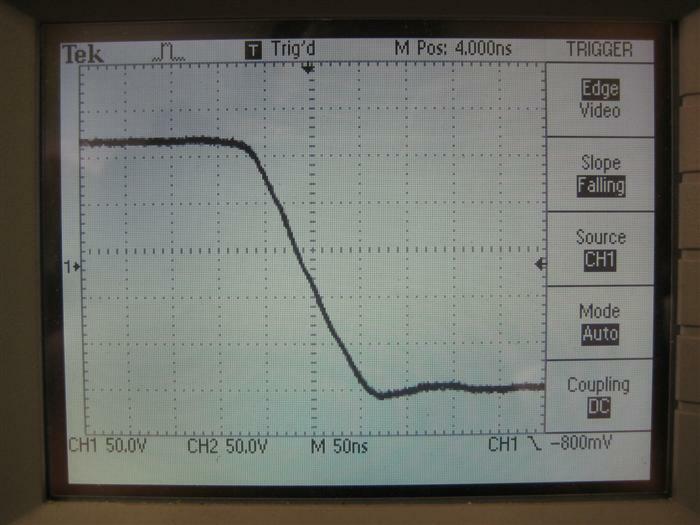 Output residual with no input is rather high, suggesting poor output filter rejection. 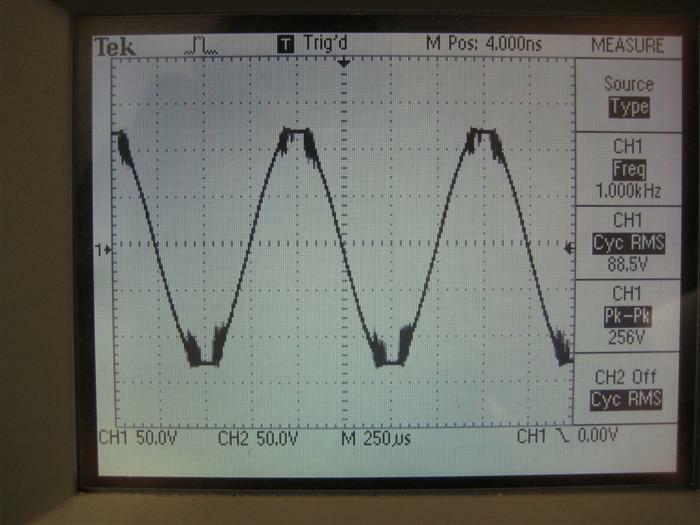 When the power is backed off about 30-40%, the waveforms become much cleaner and the distortion reduces dramatically. For this reason two power measurements were taken at each frequency and impedance point - the upper numbers in the table below are measurements at the threshold of waveform clipping (with lots of oscillation and nasties - see photos below), and the lower numbers are measurements taken at the 'threshold of oscillation' and are the highest power cleanest waveforms we could obtain. The measured performance of the amplifier is satisfactory if used below the 'threshold of oscillation' power levels. The front panel 'clip' light illuminates after waveform clipping occurs. 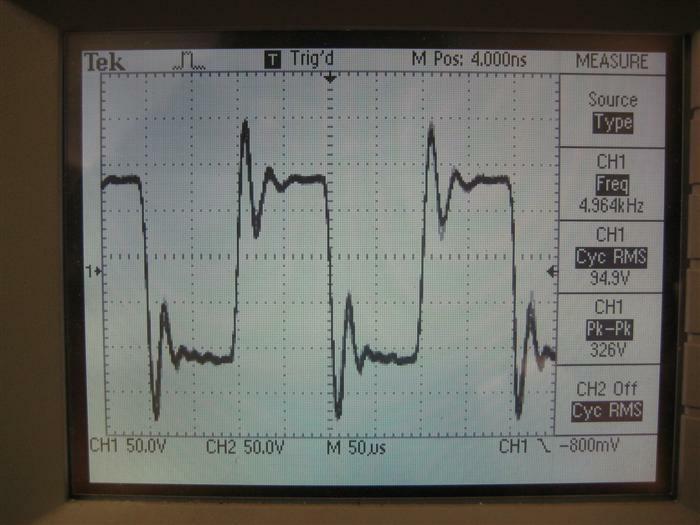 Four channel amp, but two channels (channels 1 and 2) were driven simultaneously throughout the test. 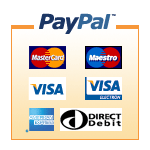 Channels 3 and 4 were checked and performed similarly. 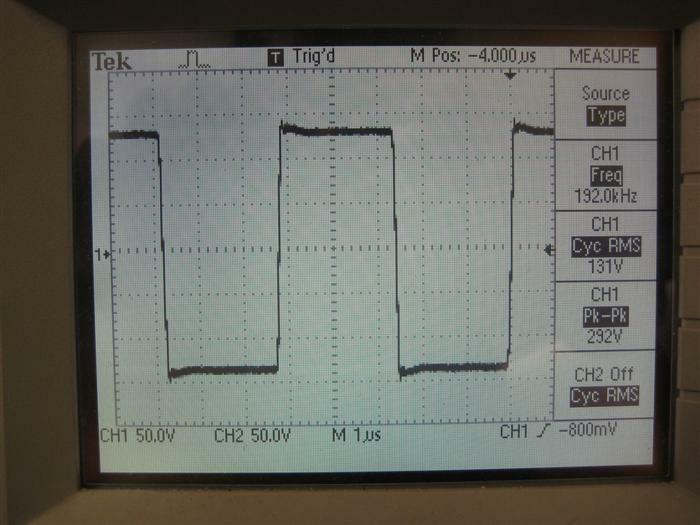 *2R Performance measurements taken with one channel driven only because of power supply current limiting. Good performance before clipping and at low frequencies, very high distortion at mid-high frequencies and potential reliability issues. Bad clipping behaviour, and internal heating of components when idle. Good looking, nicely engineered front panel, very deep casework (approx 20"). The amplifier performance is satisfactory if it is not used full range or at near full-power. Mains voltage did not fall below 239.6V. 05-06-2010. 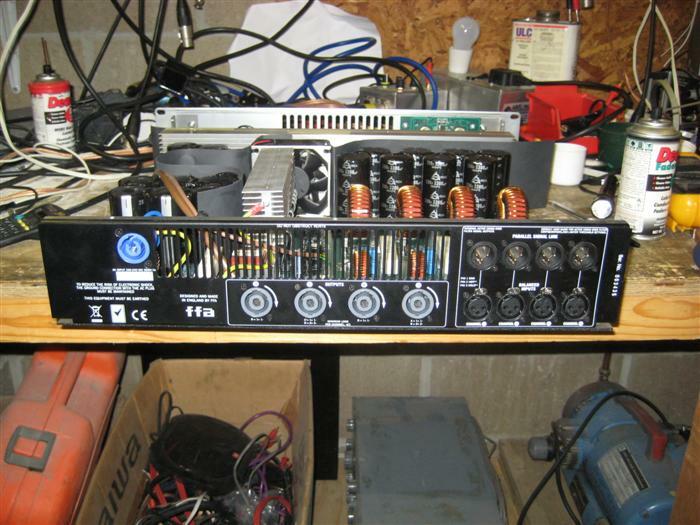 Four channel amp in natural aluminium finish (sitting on a very messy bench). Internal view. Switched mode power supply towards the top-right, Class D control circuitry along the bottom and output filters and zobel networks towards the top left. 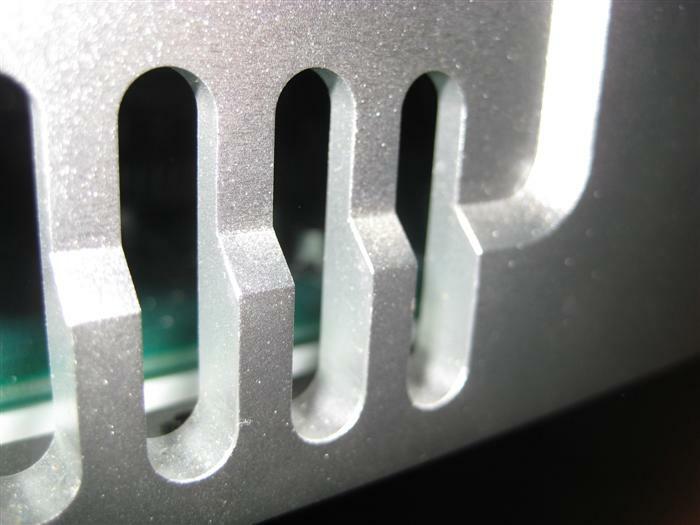 Secondary bulk storage capacitors can be seen above the horizontal main heatsink. 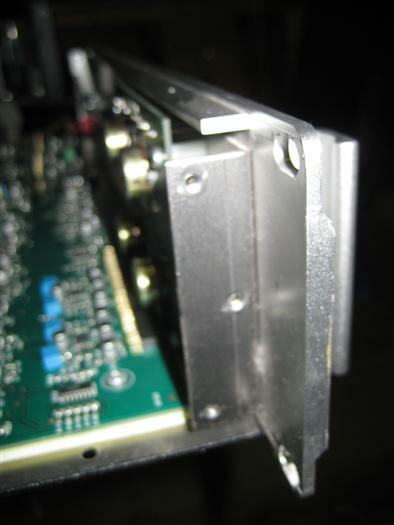 Very deep casework may not be compatible with some rack enclosures. 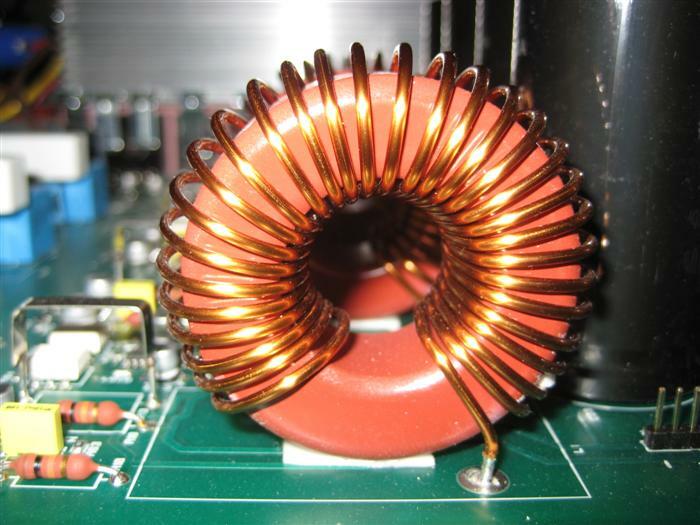 Closeup of one of the toroidal filter chokes. This bulky component is likely to work loose over time due to limited mechanical support in the form of a small piece of self-adhesive foam. Closeup of one of the Zobel resistors. Again, limited support makes this bulky and heavy item a potential failure point. The heat generated by this resistor travels down the leg into the PCB potentially causing a dry-joint. 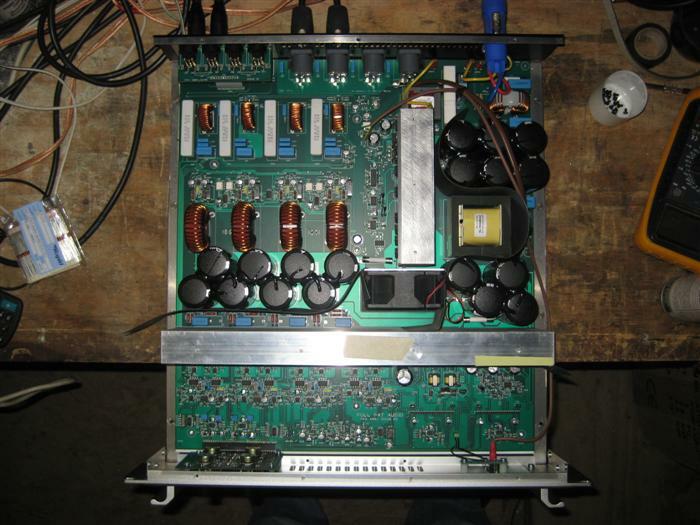 Custom wound large power supply transformer, suggesting the amp is an FFA6004 (despite having FFA4004 printed on the PCB). Hot-melt glue holding the primary smoothing capacitors together has cracked leaving the capacitors free to wobble about. 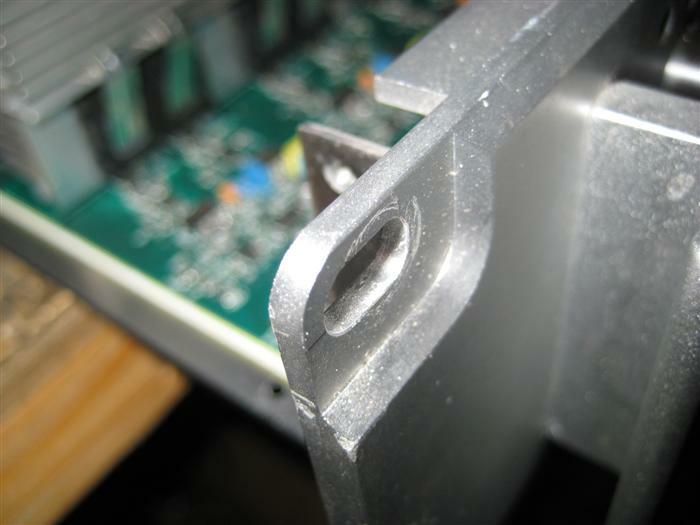 Dry-joints between the capacitor pins and the PCB could occur. Nicely engineered milled aluminium front panel approx 8mm thick. Closeup of the rack ears. Again, nicely engineered. Another shot of the front panel in profile. 20Hz Sine wave, 4R load, threshold of clipping. 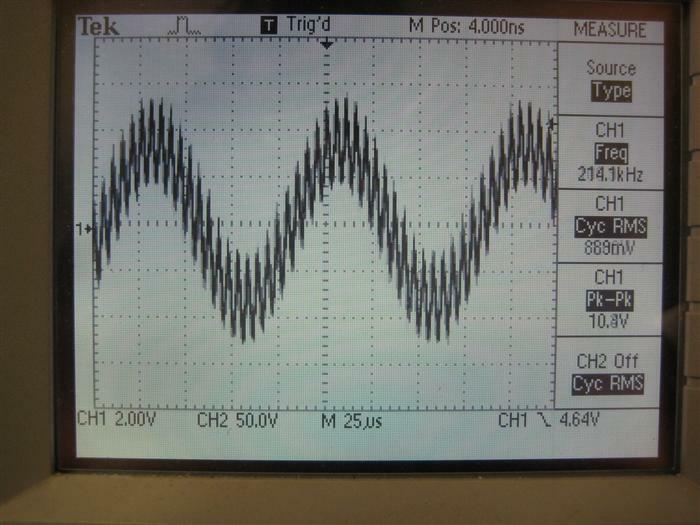 Shows instability on the top and bottom of the waveform. 40Hz Sine wave, 4R load, threshold of clipping. Shows instability on the top and bottom of the waveform. 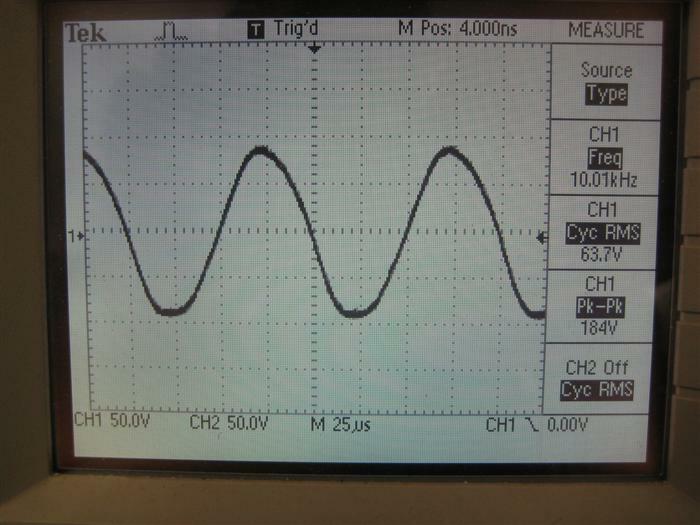 1kHz Sine Wave, 8R load, at clipping. Shows severe instability at clipping. 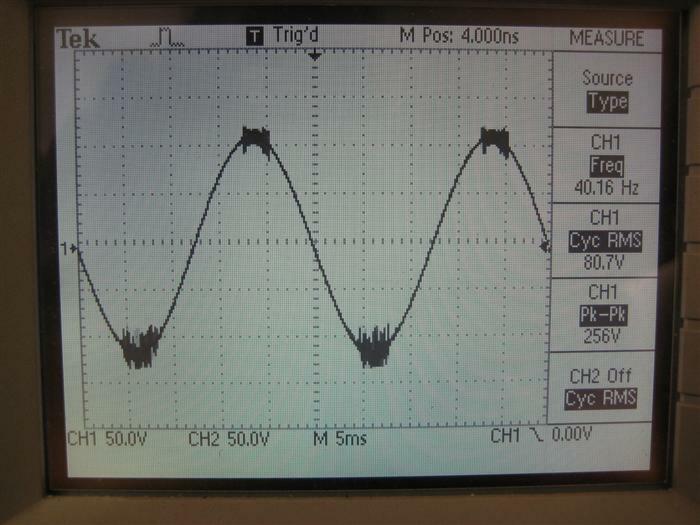 1kHz Sine Wave, low level performance. High frequency switching residual breakthrough causes the wave to appear extremely furry. 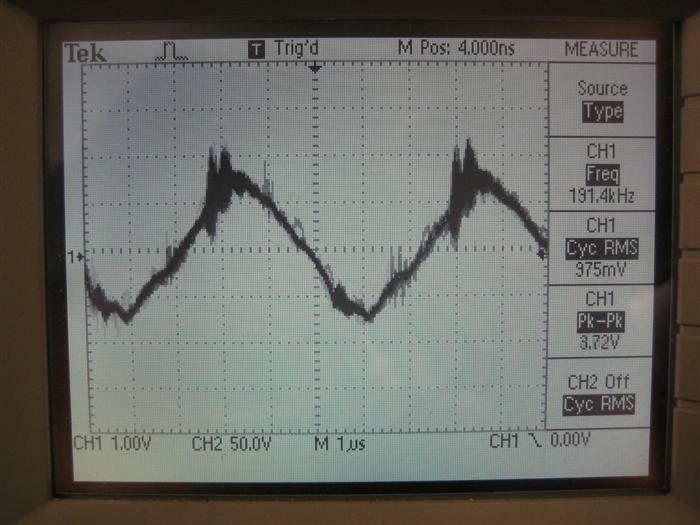 Note the scope thinks the waveform is 20kHz despite the horizontal scale - it cannot get a lock on the frequency due to the excessive out of band noise. 1kHz Square wave, 8R, threshold of clipping. Shows instability all the way along the waveform crests, and approx 120V peak-peak overshoot and short term ringing on rising and falling edges. 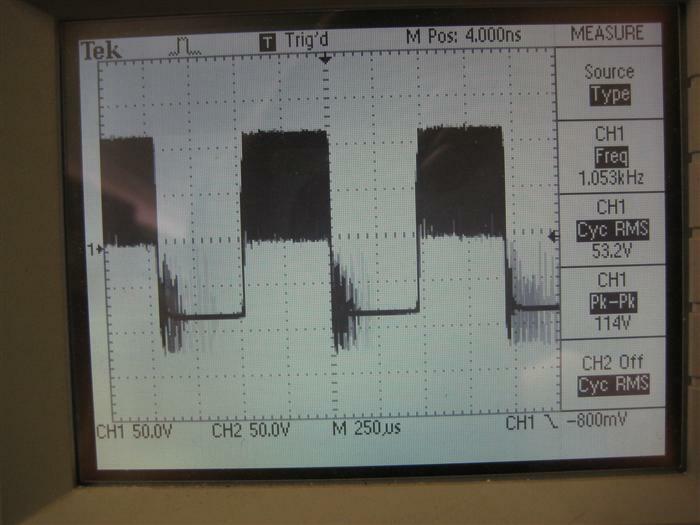 Output filter severely underdamped at high output impedances. 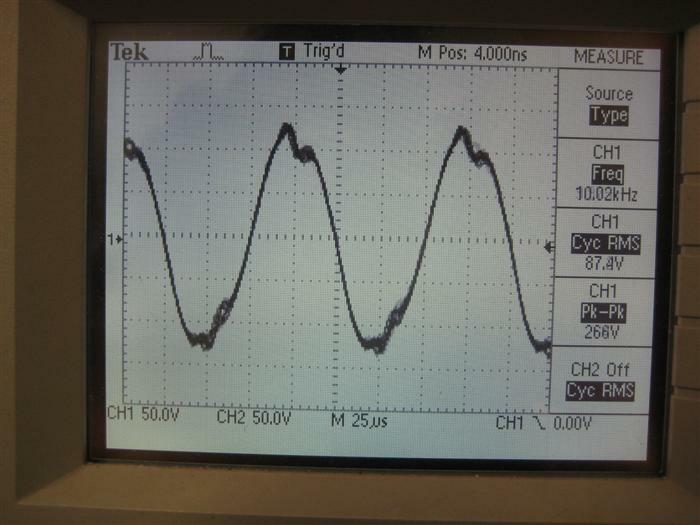 1kHz Square wave, 8R, threshold of oscillation (cleanest highest power output obtainable before instability). A small amount of residual bleed-through is still present, as well as approx 110V peak-peak overshoot and short term ringing on rising and falling edges. 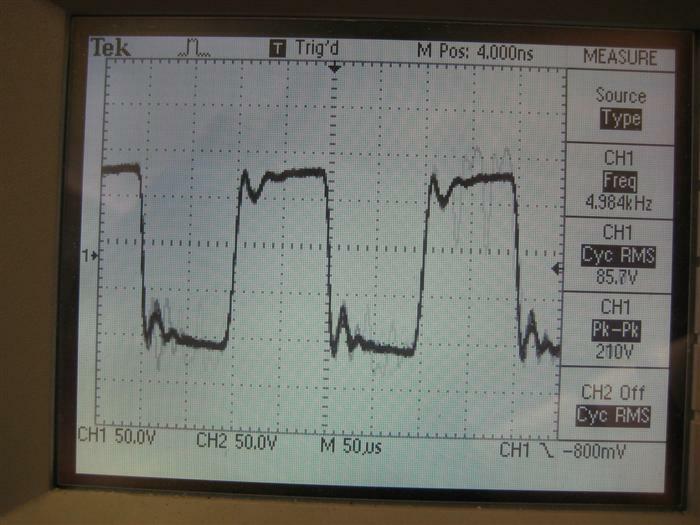 Output filter severely underdamped at high output impedances. 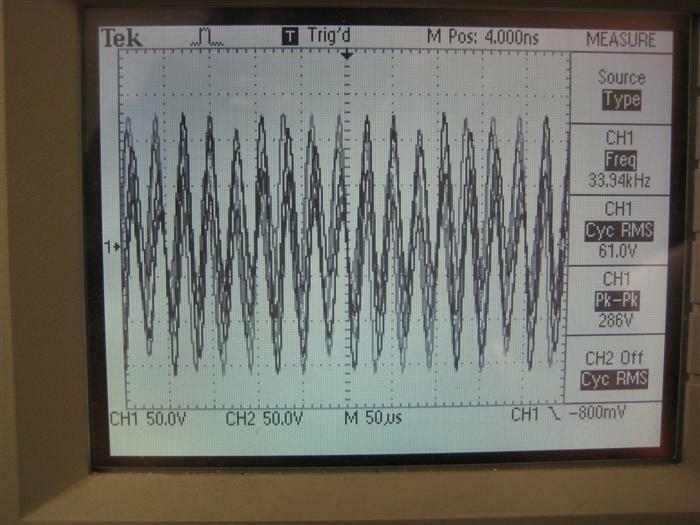 1kHz square wave, 4R, threshold of clipping. Complete mess, severe residual bleedthrough. Zobel resistors and filter chokes running extremely hot. 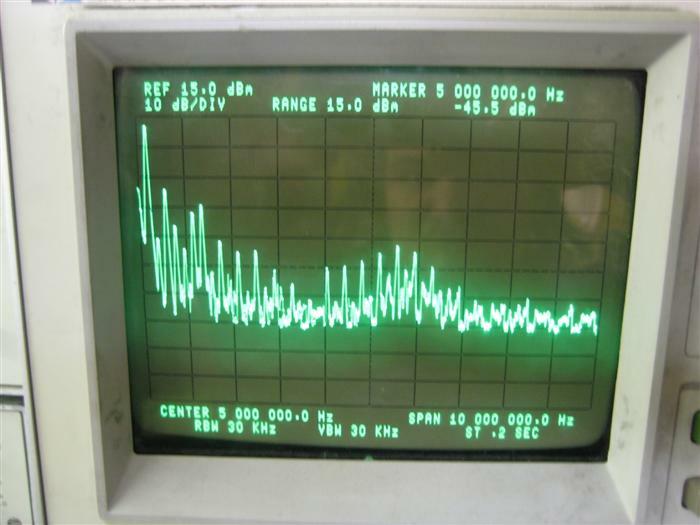 1kHz square wave, 4R, threshold of oscillation (cleanest signal obtainable). No overshoot and ringing, output filter seems to be tuned for 4R loading. 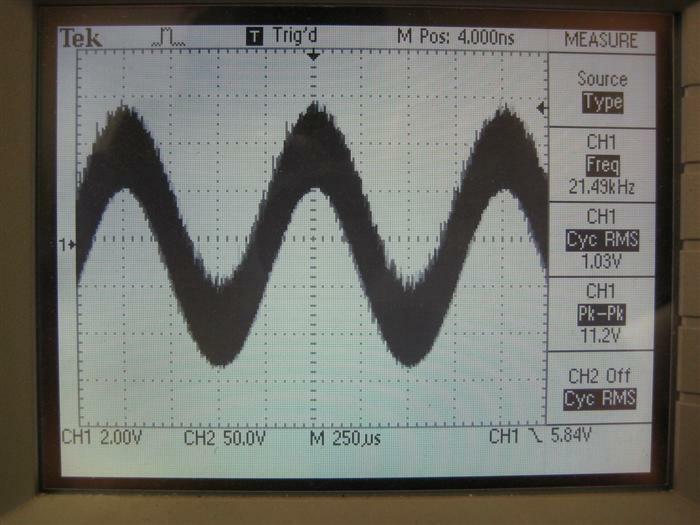 1kHz sine wave, 4R, threshold of oscillation (cleanest signal obtainable - refer to specs above). Excellent waveform, and relatively distortion-free. Very little switching residual bleed-through. 3kHz sine wave, 8R, threshold of clipping. Showing the instability in more detail. 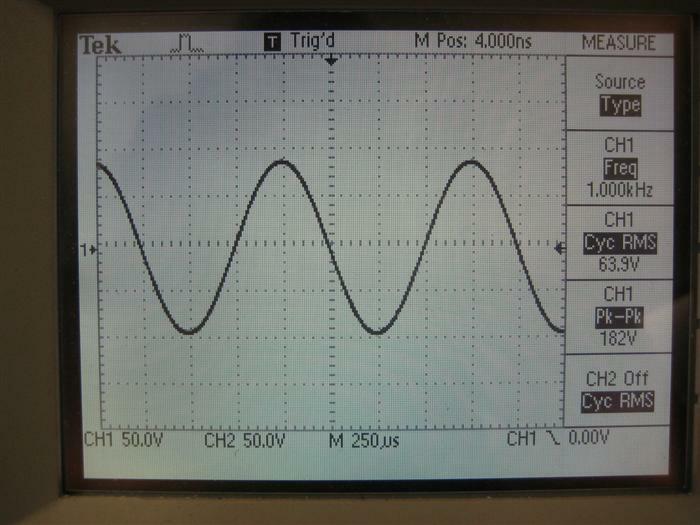 5kHz sine wave, open circuit, threshold of clipping. 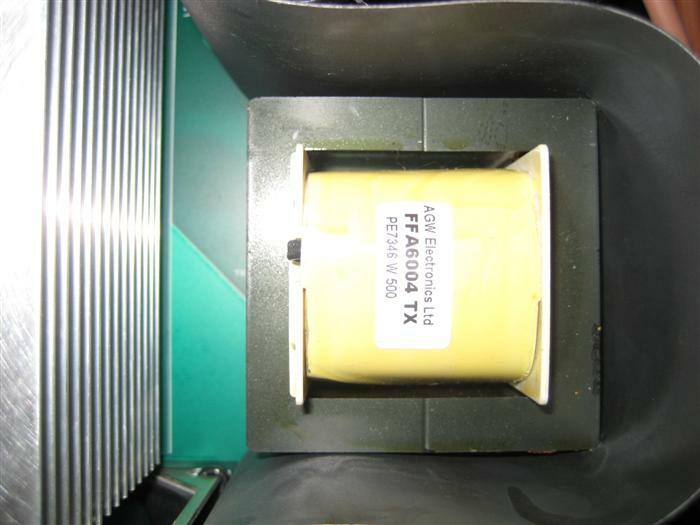 Severely underdamped output filter allows massive amounts of ringing, and switching residual bleed-through. High impedance loads are encountered at the top end of the frequency response of a tweeter. 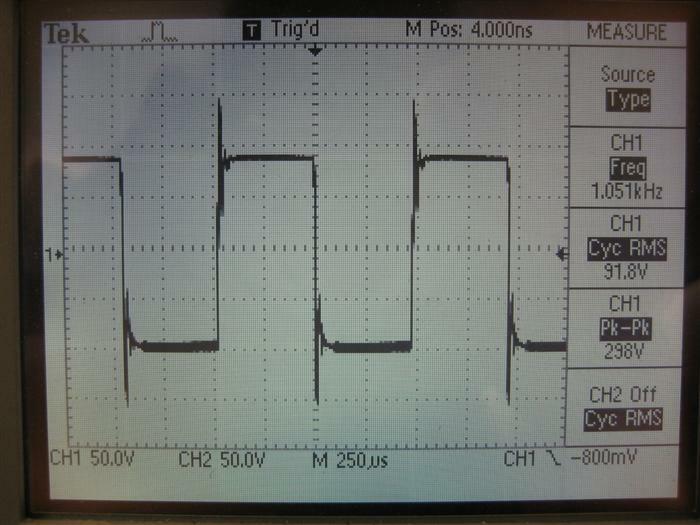 5kHz square wave, open circuit. Signal indistinguishable from switching residual and subharmonics thereof. 5kHz square wave, 4R, threshold of clipping. Shows damped ringing, but is still up to 50V peak-peak. 5kHz square wave, 8R, threshold of clipping. Shows underdamped ringing up to 140V peak-peak. 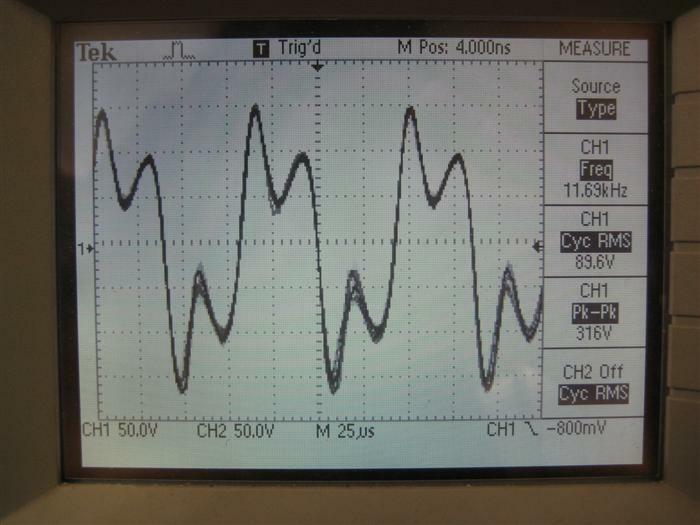 10kHz sine wave, 8R, at clipping. Heavily squared off, but instability and residual bleedthrough only partially visible. 10kHz sine wave, 8R, threshold of clipping. Heavily distorted and triangular in shape. 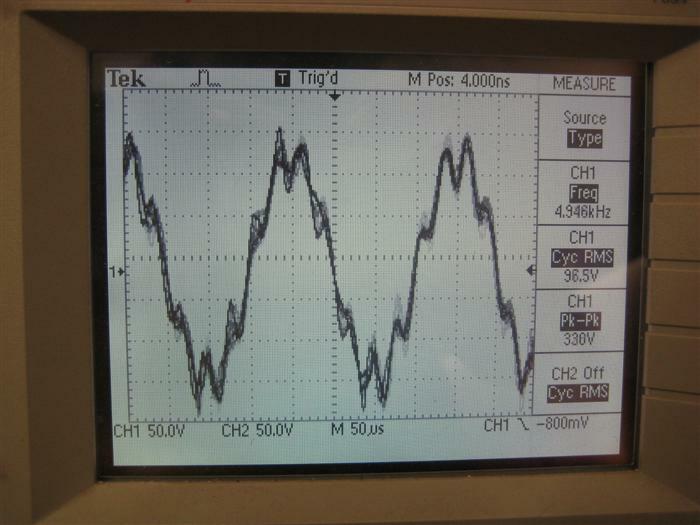 10kHz sine wave, 8R, best looking highest power waveform obtainable. Flattening at the bottom and slanting at the top shows a great deal of asymmetrical distortion (even-order harmonic). 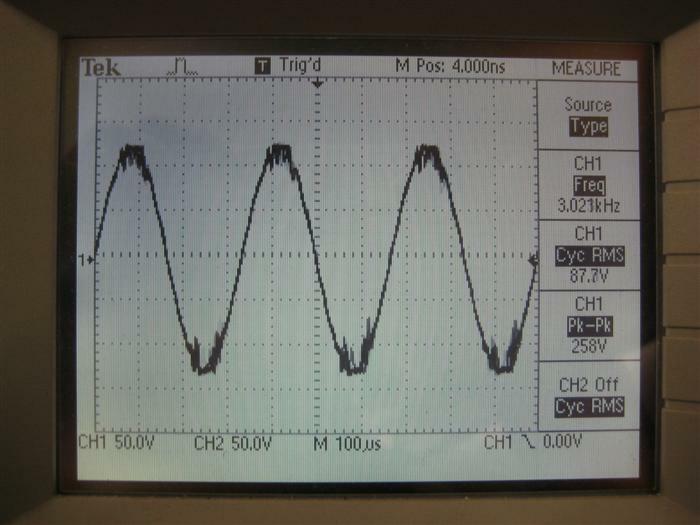 10kHz sine wave, low level. Switching residual rides over the waveform. 10kHz square wave, 8R, threshold of clipping. Very distorted and lots of overshoot. 10kHz square wave, 8R, low level. Switching residual rides over waveform. 50% overshoot despite being very low level (approx 10V p-p). 11kHz square wave, 8R, threshold of clipping. More overshoot. Quiescent output residual, 8R, no input. 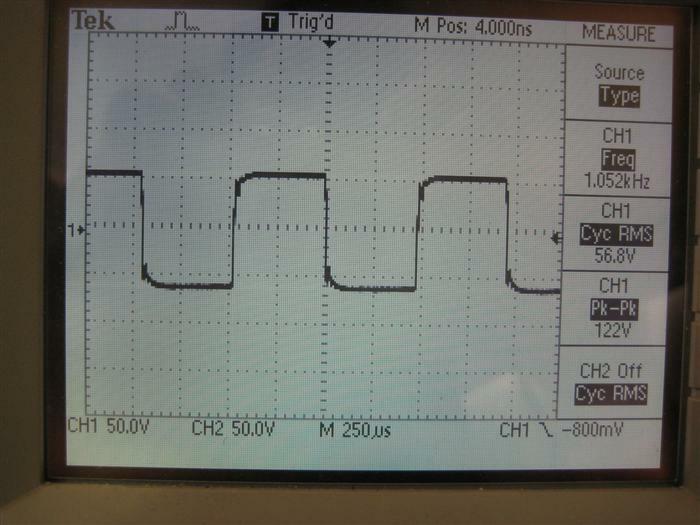 Shows output switching residual at approx 4V p-p. Residual should ideally be sinusoidal in shape, and the bursts of instability on the top part of the rising edges of the waveform are a potential EMC concern. 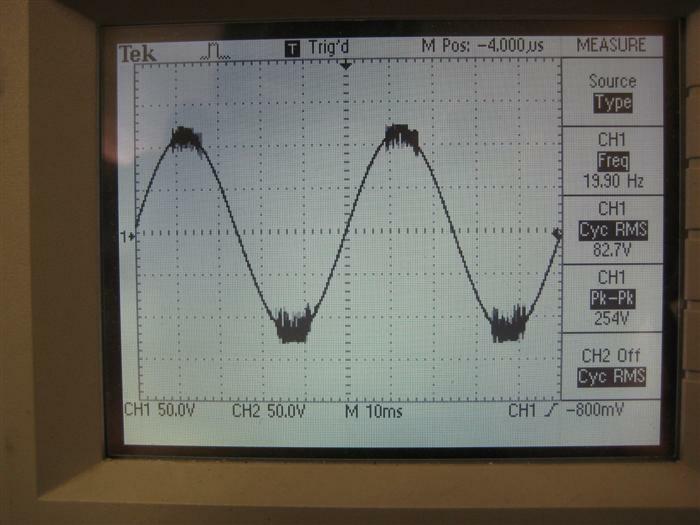 Quiescent switching waveform PRIOR to the output filter chokes. Very fast and almost exactly 50% duty cycle, with no overshoot. 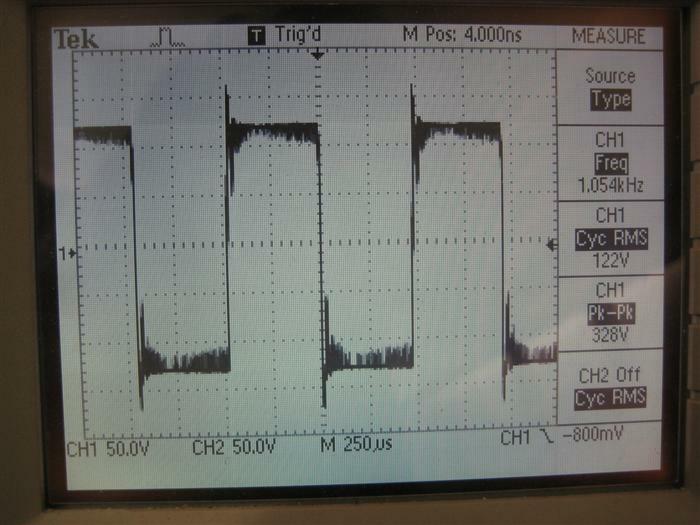 Quiescent switching waveform rise time approx 150ns - which is very good. 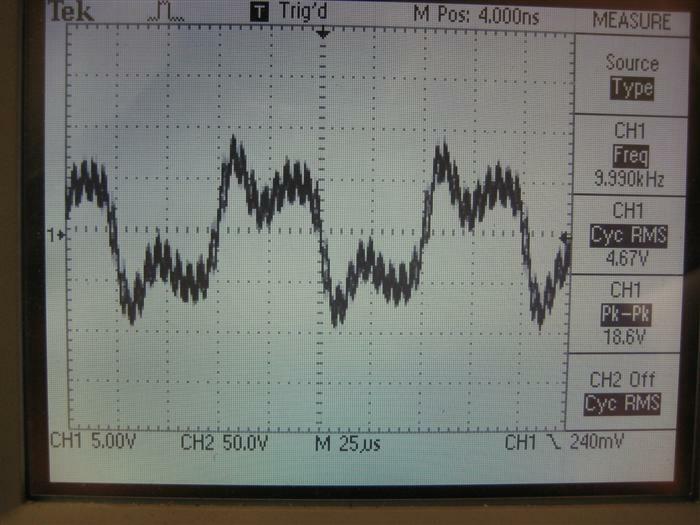 Quiescent switching waveform fall time approx 150ns - which is very good. Quiescent output residual spectrum, 400kHz bandwidth. Showing 192kHz residual and harmonics thereof. 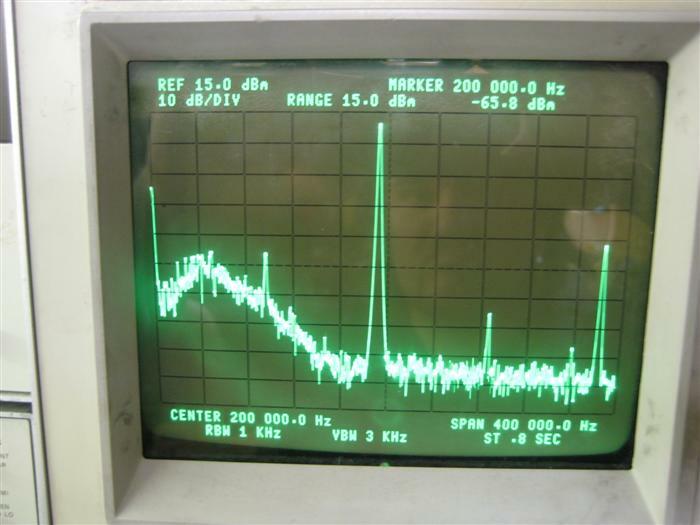 Quiescent output residual spectrum, 10MHz bandwidth. Switching harmonics present all the way to 7MHz.